My 4 oldest kids have all had their Halloween costumes for nearly two months. We bought costumes for the three oldest to wear to Comic Con and then wear again for Halloween. My second youngest was going to wear one of her older sister's old princess dresses so she was set too. Then we have our youngest. I had no idea what she was going to wear. She didn't dress up for Comic Con, she didn't dress up for the halloween party we went to last week. She couldn't just wear her sister's costume from last year because she was the Tin Man which was cute as part of the group but a little weird by itself. I wanted to make her a costume because all of the other costumes were store bought and I think homemade costumes are just more fun. The problem was that I could not think of a single good idea of what to make for her. A few days ago I was talking to my husband about it and he came up with the perfect idea. Her nickname is Mare-Bear so he suggested we do a Care Bear costume. I thought it was perfect for her. Mare-Bear the Care Bear. I decided to go semi-homemade for her costume. We decided on Cheer Bear so we needed pink clothes. She had some pink leggings and I bought a cheap pink turtleneck from Walmart. 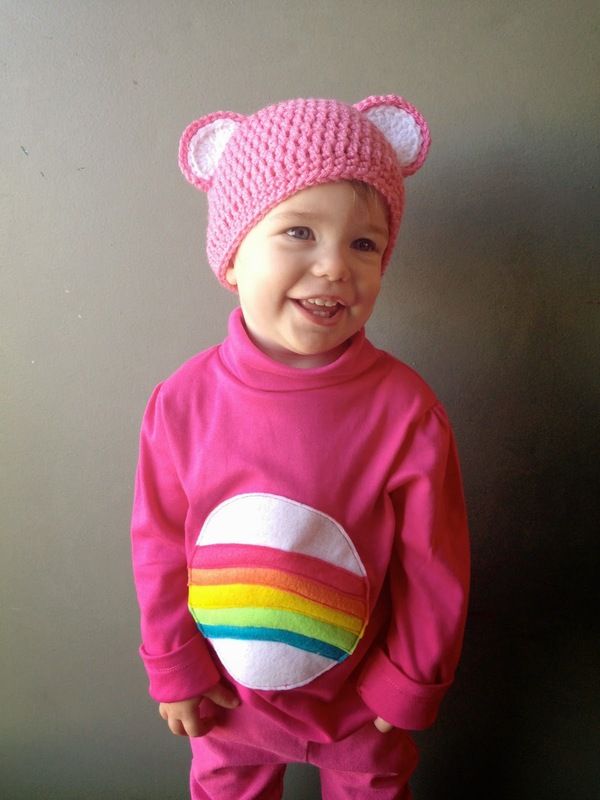 I appliquéd the belly patch on the shirt using felt and made her a pink hat with bear ears. All of the pinks are different shades but I didn't really worry too much about that, it is a Halloween costume after all, it doesn't need to be perfect. I picked the shirt up a few days ago but then when I sat down to make it I realized that I didn't have enough of the colors of felt that I needed. After a late night Walmart run, after the kids were in bed because it is so much easier to go by myself, the night before Halloween I finally sat down and made her Halloween costume. I had made the hat earlier in the week so it really only took a few minutes of sewing and I was done. Even with the three different shades of pink I think that it tuned out awfully cute. Super simple and really cute, perfect. We have found several kinds of festivals in different countries during New Year and Christmas such as; Halloween and Thanksgiving. In these festivals we used to wear new costumes, prepare delicious recipes, theme parties and many others. Here in this article also we have found some Halloween costumes which look amazing and outstanding.